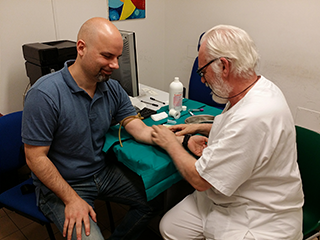 The scientific experimental research on my DNA to compare the adaptation to freediving of man and dolphin, led by "Sapienza" University of Rome, continues. Presentation at the MPR lawyers' conference to speak about stress and emotions management, and introduce myself as Testimonial of the MPR Mediatori Professionisti Roma Association. Arrigoni was awarded by the IPRA International Physical Rehabilitation Awards, for his commitment to voluntary social activities for disabled people. 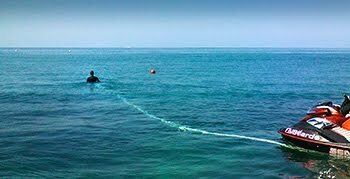 Exactly 17 years after the death of his cousin Stefano, who lost his life at sea in Limnionas at age 17, Simone Arrigoni established his 17th freediving world record, in the discipline of the Dolphin's Breath, 500 mt at sea with 35 single breaths (total time 9' with 35'' of breathing) . Arrigoni went back to playing a classical piano recital after a 20 year absence, with musics by Bach, Chopin, Rachmaninoff and Scriabin. Arrigoni played piano music by Chopin and Scriabin during a Benefit Gala for the Comboniani's dental clinic for immigrants. 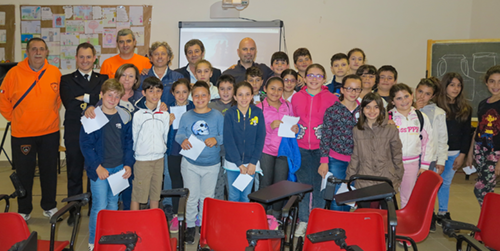 Arrigoni gave a class on Safety at sea to Elementary and Middle School students in Santa Marinella. 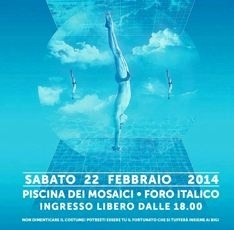 Festival "Sport's Stories at Castel Sant'Angelo". Arrigoni has been collaborating at the Doctoral research project led by the University of Rome La Sapienza, the University of Pisa, the Extreme Center of the Scuola Superiore Sant'Anna, and the CNR, in order to investigate the freediving adaptive systems of humans and marine mammals, with the aim of improving medical knowledge about physiological reactions and genetic adaptations at lack of oxygen conditions. On May 28 he held an official performance at Zoomarine to present this scientific project, making 7 underwater loops pushed by the dolphin Marco. 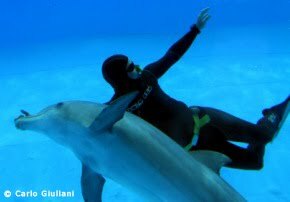 On the International Day for Biological Diversity, Arrigoni (who has been collaborating with Zoomarine Italia for seven years) has broken his freedive world record during a puplic performance, making 15 underwater loops pushed by the dolphins King & Leah. Some medical parameters have been surveyed to carry on the research project of the Zoomarine Trust Onlus, that aims to study the similarities and differences between man and the bottlenose dolphin. Arrigoni partecipated to Angeli dello Sport / Angels of the sport, together with other water sport champions, to remember the young diver Matteo Marchetti and to raise funds for the Bambin Gesù pediatric hospital. Arrigoni has set a new world record with a particular Dive Propulsion Vehicle, named Flyboard, covering a distance of 500 mt in 2 minutes and 39 seconds, with an average speed of 189 mt/minute. As prologue of the Giochi del Mare / Sea Games, the "olympics" of summer sports (organized by FiBa in collaboration with the "Regione Calabria" and the Italian Coast Guard), on the 3rd of June Arrigoni made a freediving performance at the Dino's Island in Praia a Mare, underwater swimming across the amazing Grotta Azzurra / Blue Cave. From the 4th to the 9th of June Arrigoni ran a volunteer course for a group of 30 children of the non-profit association "Il Seme" in a swimming pool in Reggio Calabria. 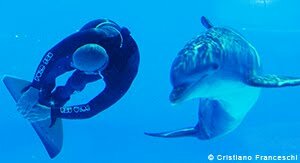 Arrigoni, who has been collaborating with Zoomarine Italia for six years, is participating in a research project, led by Zoomarine Trust Onlus (a non-profit organization), to study the effects that freediving performance may have on the human body and compare them with the other studied species, the bottlenose dolphin. On the 23rd of May Simone has broken his freedive world record during a puplic performance, making 14 underwater loops pushed by the dolphins Paco & Marco, and some medical parameters have been measured on the athlete to be compared with the data collected during the training sessions. Francesca Patrignani, La motricità acquatica: analogie e differenze tra l'uomo e il tursiope (Tursiops truncatus), Tesi di Laurea in Scienze Motorie, relatore Prof. Valter Magini, correlatore Dr. Valerio Manfrini, Università degli Studi di Roma "Foro Italico", a.a. 2011/2012. [Francesca Patrignani, The Aquatic Motricity: Similarities and Differences between Man and the Bottlenose Dolphin (Tursiops truncatus), Thesis in Sport Sciences, supervised by Prof. Valter Magini and Dr. Valerio Manfrini, Italian University of Sport and Movement "Foro Italico", Rome (Italy), academic year 2011/2012]. 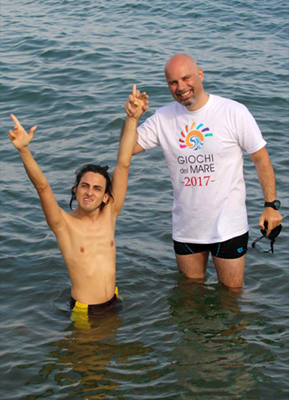 Arrigoni held a Freediving, breathing and relaxing techniques volunteer course for disabled persons.